BCS Cadre Services job is one of the most lucrative jobs in Bangladesh now. 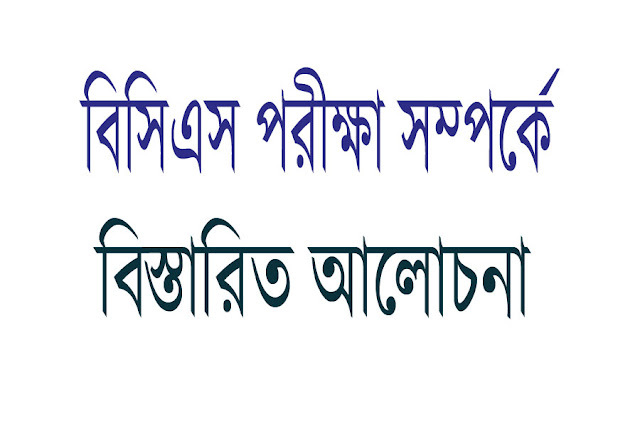 BCS Examination is arranged and controlled by Bangladesh Public Service Commission. Dr. Muhammed Sadique is the honorable chairman of BPSC now. However, today's post is about the briefly discussion on BCS Exam, procedures, syllabus, and these related things. The official link of BCS syllabus is here. BCS circular is published on the basis of Bangladesh Civil Services rules/regulations which are described here. Some of these are in general cadres and others are in technical/professional cadres. When did BPSC publish BCS Exam circular? At first, BPSC requests Ministry of Public Admistration to send Cadre wise vacancy list each year and after getting the list BPSC becomes ready to publish BCS advertisement through national newspapers and its official website. 1. A Master's Degree from any recognized university or a Degree of 4 years education completion after passing HSC Examination. But candidates who have more than one third division in academic life will not be eligible. 2. If any candidate has completed final written examination of minimum qualification(Ex: B.Sc. final year exam) in his academic life within last date of BCS Exam application will eligible to apply. 3. All candidates must show their all educational certificates/provisional certificates before the VIVA-VOCE of BCS Examination. Educational qualification for technical/professional cadre depends on the respective cadres and a minimum graduation degree is needed for applying in technical / professional cadre. What is the age limit of BCS Examination? 1. Minimum 21 years and maximum 30 years is needed to apply for BCS Examination. Is one candidate is below 21 years or above 30 years on the first date of the month when the BCS advertisement published will not be eligible to apply. 2. But the maximum age limit for the freedom fighters, their sons, disable candidates and BCS(Health cadre) is 32 years, in the other cases age limit is 30 years. 3. Birth date of SSC examination certificates or other authorities will be evaluated as the proof of their age. Candidates from O level or A level will also evaluated in this way. BCS Application Form Submit: through Online by BPSC official link described in the circular. Application Fee: TK. 700 usually payment by Teletalk payment system, described in the circular, for disable and ethnic minority group the fee is only TK. 100. After completing all processes of application, candidates will be able to download his admit card to seat for the BCS examination. How will be BCS Preliminary Examination held? BCS Preliminary Examination is based on Multiple Choice Questions(MCQ). 200 MCQ questions and each question will carry one mark and 50% mark will be deducted for each wrong answer. Candidates will make answer in OMR answer sheets for evaluating by OMR Machine. The qualifying marks will be decided by BPSC before publishing preliminary result. Candidates who are selected in preliminary exam will be considered to seat for written exam. BCS Written Exam syllabus is given below. BCS Examination Time: for each subject 4 hours for 200 marks and 3 hours for 100 marks. A candidate securing less than 30% marks will be considered as no marks in that subject. All candidates must obtain 50% marks in the written examination as qualifying marks. Each viva board consists of a BPSC member as Board Chairman, a departmental representative and an expert selected by BPSC and other examiners. Total marks of viva is 200 and qualifying marks is 50%. The viva board will test candidates intelligence of mind, vigour, and strength of Character. The board will also consider candidates extra curricular activities such as sports, debates, hobbies etc. Good luck for your examination. Stay with this website to inspire us.